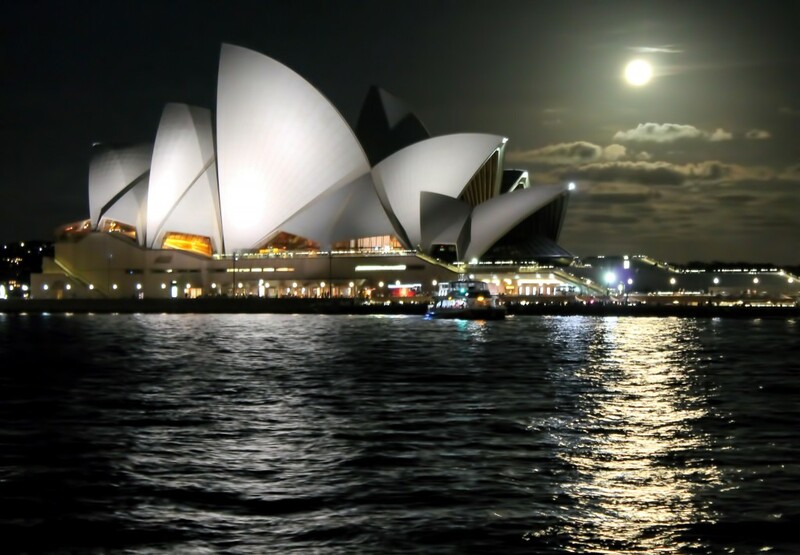 Culture Trip takes a tour of the world’s most stunning opera houses, taking in the grand old concert halls of Europe to more modern structures like the magnificent Sydney Opera House. Quite possibly one of the world’s most famous opera house, Milan’s La Scala was built in 1778 according to designs by Italian neoclassical architect Giuseppe Piermarini and debuted with Antonio Salieri’s two act opera L’Europa riconosciuta. Over its 250-year history, La Scala has hosted performances by some of the classical music world’s most luminary talents including celebrated conductor Claudio Abbado and opera star Maria Callas. La Scala Museum pays homage to the opera house’s rich history with its exhibitions of costumes, musical instruments, photographs and set designs and the Livia Simoni Library, home to 150,000 volumes of librettos, scores and periodicals. 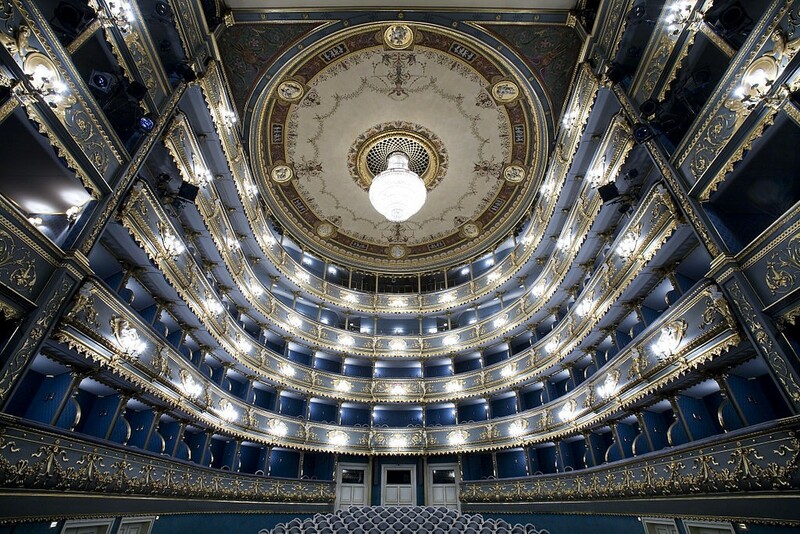 Founded by Prague-born aristocrat Count František Antonín Nostitz Rieneck in 1783, the Estates Theater is one of Europe’s oldest, continuously operating theaters and – with its stunning white, gold and blue auditorium – one of its most beautiful too. In 1787, the theater presented the world premiere of Mozart’s acclaimed Don Giovanni and later, in 1791, debuted his opera La clemenza di Tito – in fact, scenes from Czech director Miloš Forman’s Oscar-winning film Amadeus were shot there for authenticity. The historic theater was also the premiere venue of the first modern Czech opera, František Škroup’s The Tinker, and what would later become the Czech national anthem ‘Kde domov můj?’ (‘Where Is My Home?’), written by Škroup and playwright Josef Kajetán Tyl. Located a short walk from Red Square and the Kremlin, The Bolshoi Theater is one of Moscow’s most emblematic landmarks. Dating back to 1776, the theater has enjoyed a colorful history and many incarnations though its current form – boasting a beautiful façade complete with a grand portico topped by a statue of Apollo and his horse-drawn chariot by sculptor Peter Klodt – was designed by Russian-Italian architect Alberto Cavos following a devastating fire in 1853. 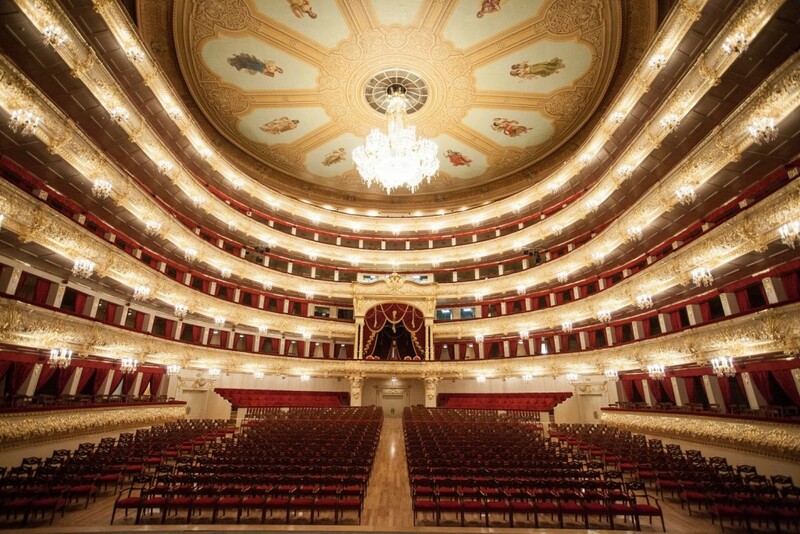 Between 2005 and 2011, The Bolshoi Theater’s interior underwent extensive renovations retaining its original features but adding new state-of-the-art stage, sound and lighting equipment, bringing the historic building firmly into the 21st century. Nestled on Bennelong Point overlooking Sydney Harbor, Sydney Opera House is a dazzlingly contemporary addition to the Australian city’s skyline, and one of its most distinctive. Designed by Pritzker Prize-winning Danish architect Jørn Utzon and officially opened in 1973, the opera house’s first public performance was a rendition of Sergei Prokofiev’s War and Peace and in 2007 the building was recognized as ‘a great architectural work of the 20th century’ and designated a UNESCO World Heritage Site. Featuring five theater spaces plus a forecourt for outdoor concerts, Sydney Opera House hosts performances by Opera Australia, the Sydney Theater Company, The Australian Ballet and the Sydney Symphony Orchestra. First constructed in 1869, the original Vienna Staatsoper was almost totally destroyed – save its Tea Salon, the Schwind Foyer, its main façade and grand staircase – by Allied bombing during World War II, but thankfully rebuilt under the instruction of Austrian architects Erich Boltenstern and Otto Prossinger reopening in 1955 with a performance of Beethoven’s Fidelio. 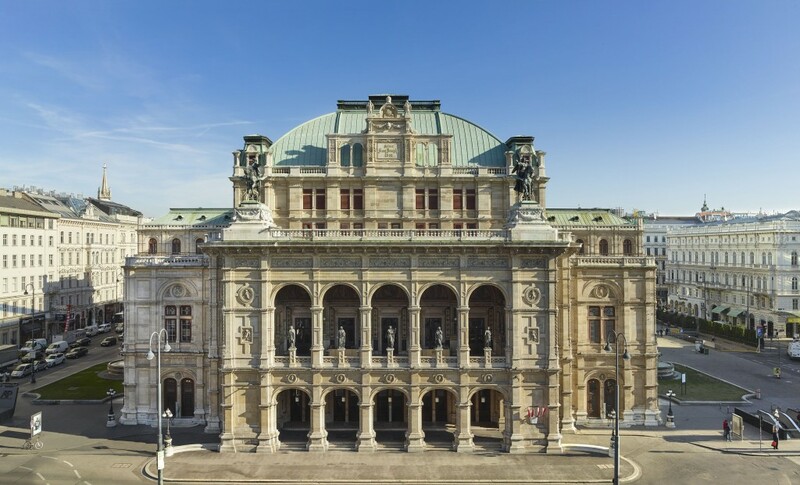 Today, Vienna Staatsoper boasts the world’s widest repertoire with over 300 performances of more than 60 operas and ballets during its September to June season and each year hosts the grand and glamorous Vienna Opera Ball, one of the Austrian capital’s most prestigious high society events. 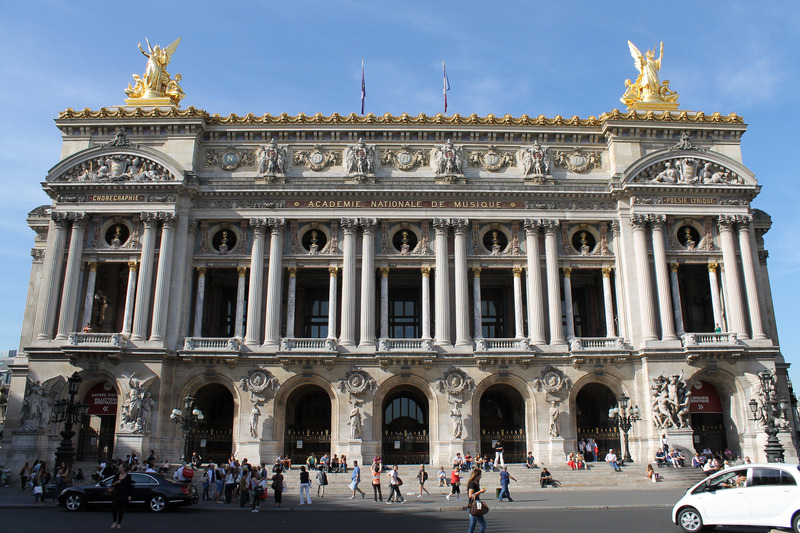 Built between 1861 and 1875 and designed by French architect Charles Garnier, Paris’s Palais Garnier – the setting of Gaston Leroux’s novel The Phantom of the Opera – is one of the city’s most iconic buildings. A beautiful Beaux-Arts style exterior – complete with its imposing façade adorned with busts of great composers like Rossini, Beethoven and Mozart and magnificent copper dome – welcomes theater-goers, while its lavishly styled interior boasts a Neo-Baroque aesthetic and a grand, horseshoe-shaped auditorium featuring frescoes depicting scenes from celebrated operas created by Russian-French modernist painter Marc Chagall and unveiled in 1964. 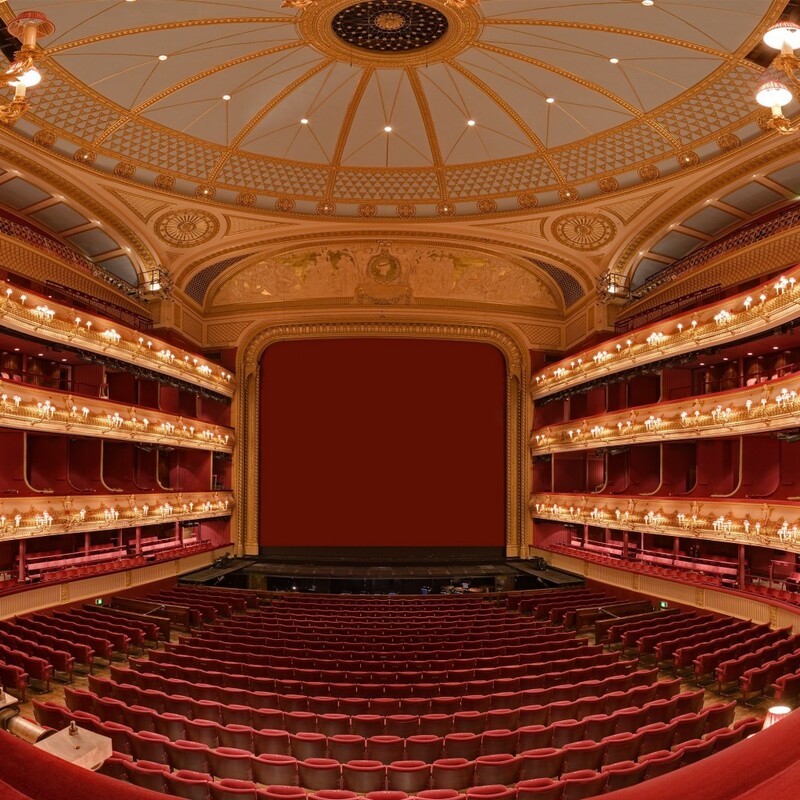 Though it has existed in some form since 1732, the current Royal Opera House that stands in London’s Covent Garden is the third incarnation of the building opened in 1858, the previous two having been destroyed by fire. During its early years, German-born composer Handel wrote many operas and oratorios specifically for the Royal Opera House and throughout World War II, the theater was used as a dance hall after which it became the home of the Royal Ballet and Royal Opera. In recent years, the theater has seen performances by some of opera’s biggest stars including Plácido Domingo, Luciano Pavarotti and Joan Sutherland. 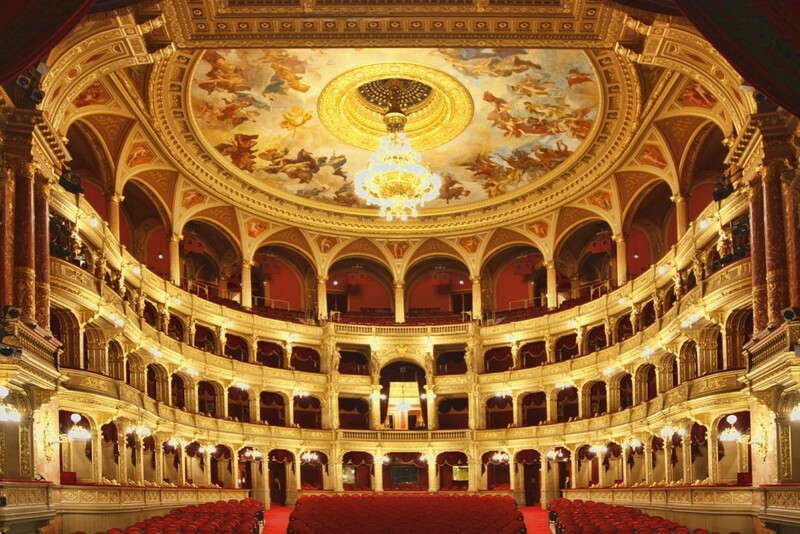 Designed by famed architect Miklós Ybl, the beautiful, Neo-Renaissance-style Hungarian State Opera in Budapest opened in 1884 and remains virtually unchanged more than 130 years later. Statues of celebrated Hungarian composers Ferenc Erkel and Franz Liszt greet visitors at the opera house’s entrance, and inside its full opulence is revealed: a marble-paneled foyer leads to a grand double staircase, often hailed as one of the theater’s most impressive features, while its auditorium is equally lavish with three floors decorated with a red and gold motif sitting under a dramatic bronze chandelier and a frescoed ceiling painted by German-Hungarian artist Károly Lotz. 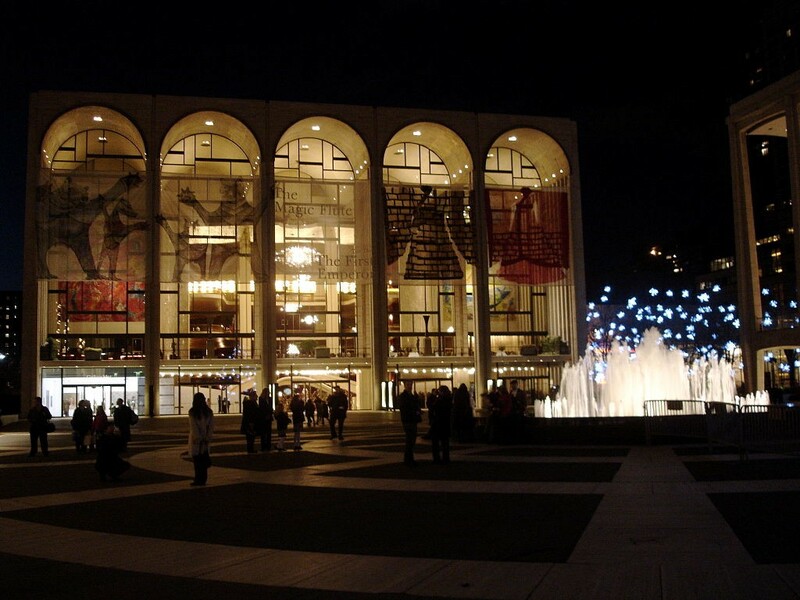 The modernist Metropolitan Opera House in New York City, part of the Lincoln Center for the Performing Arts complex, was designed by American architect Wallace Harrison – the same man behind other famous Manhattan structures including the Time-Life Building – and opened in 1966. Its lavish foyer is dominated by five huge, arched windows giving way to two large modernist murals by painter Marc Chagall named The Triumph of Music and The Sources of Music and illuminated by several dramatic Swarovski crystal chandeliers, while its grand six-level auditorium has premiered many modern operas including John Corigliano and William Hoffman’s The Ghosts of Versailles and Philip Glass’s The Voyage. 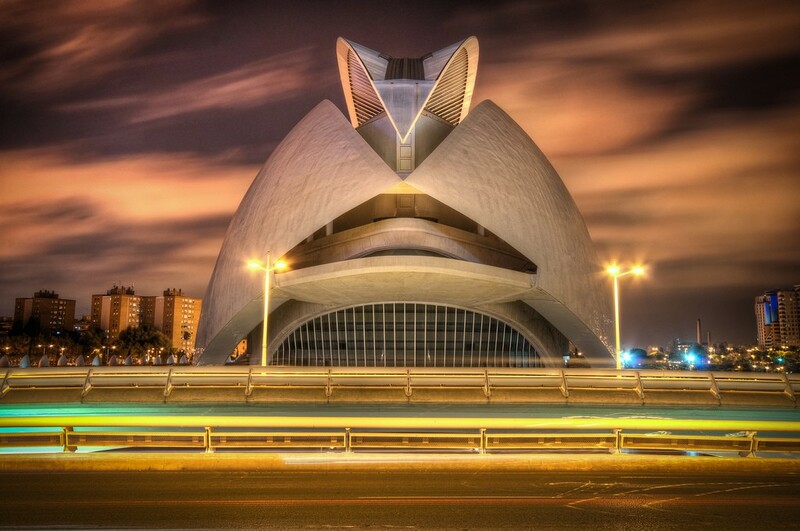 Valencia, Spain’s Palau de les Arts Reina Sofía opened in 2005 and features a breathtaking contemporary design by locally born, internationally renowned architect Santiago Calatrava. Nestled on the edges of Valencia’s beautiful Turia Gardens, the building is truly immense, soaring an incredible 246 feet high and covering an area of over 430,000 square feet while inside its four venue spaces host a variety of operatic, musical, theatrical and ballet performances. In 2006, Palau de les Arts Reina Sofía hosted Operalia, The World Opera Competition – an international contest for young opera singers founded in 1993 by late, great Spanish tenor Plácido Domingo and its most recent season has seen performances of operas including La Bohème, Aida and Café Kafka.